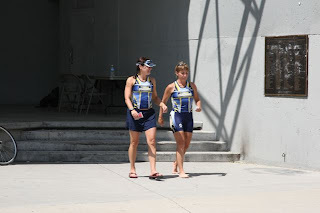 After some encouraging words from StevieP, I headed to the swim start and we were off! But wait, oh crap, it felt like my timing chip was loose and about to come off - how did that happen? Well OK then, no kicking. Gulp, gag, almost lose it......yuck I hate taking in water.....why is this person swimming the wrong way and why do I have to stop and let him go?........ewwwww lake stuff in my face......but wait there's the finish yea!!!! Out of the water and on my way to transition I looked at my watch and saw a 22 something time, very nice - I'll take it. Mat time: 23:41. T1: Transition was uneventful and guess what, there was nothing wrong with my timing chip......nothing like mind games in the swim. 55 seconds. T2: Shoes went on, grabbed my number, visor and a goo just in case and off to the run! Before the race, I made a couple of bets with Steve one of which was to break 49 in the run. It seemed pretty aggressive since the fastest I have a run a 10k was 48:40 without swimming and biking before. After the legs situation on the bike I just figured I was buying Steve a beer and settled m mind to concentrate on my form and finishing strong. I heard Priscilla on my way out (THANK YOU!!!) and started to run. Hmmmm, legs OK. Hmmmm, heart rate OK. Hmmmm, mile 1 good to go!!! Things were off to a good start. The best part of the run was seeing Steve, Ed, Neil, Sonja, and Tyler before the turnaround and they all looked GREAT! My bogie from the bike also kept getting closer and right before the turnaround I pulled up on her shoulder to see how she was doing and if she'd put up a fight (yes, I learned my lesson from the sprint). She was breathing HARD and didn't sound too strong so I went ahead and passed her and didn't look back. The miles just kind of kept passing and before I knew it I was back at the last aid station gearing up for the last mile. Sonja was around the bend yelling her big heart out at me telling me to pass the girl in front of me. So I passed the girl, and on the final stretch saw the rest of my AWESOME teammates and gave it my all to the finish line. As for the bet with Steve? I lost the first part (which I so thought I had in the bag), but won the run pace bet with a 47:53 - my best 10k evah! Beer me! Everyone had a fabulous day and Practical Coaching had an impressive showing on the podium! And the topper? 2nd place in age group Woo hoo! Me & Beth on the "podium"